So, just what do you get for your £80? Just how ‘basic’ is their entry-level nuvi 30? Well, to be honest my first impressions were very good and I’ll admit I was genuinely surprised at how many features had been included in this budget PND. 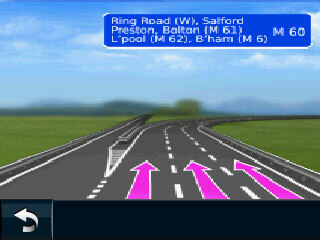 It has Text-to-Speech (TTS) so road names are read out to you in full; it has Lane Guidance so on motorways and other large roads you know which lane to get into; it has Junction View so you can get a photo-realistic view of the junction ahead; it displays the current road speed limit; it has the latest NAVTEQ mapping (2012.10); it has a micro SD slot for map updates; and it also has the Cyclops speed camera database (although our own CamerAlert database can be installed easily) and millions of POIs for shops, restaurants, airports etc (again our POIs can be easily installed too). It’s par for the course these days that no USB lead is included, there’s also no instruction manual. 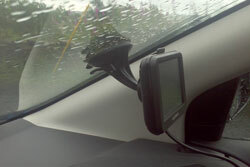 However, you do get the windscreen mount, power lead and a basic quickstart guide. Set up is simple and the satellite fix from a cold start was certainly fast enough. 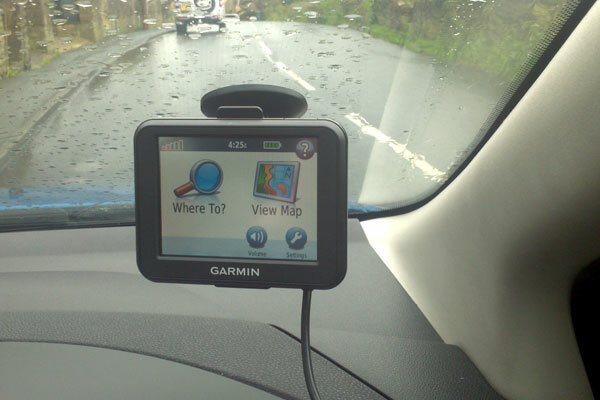 The nuvi 30 uses Garmin’s tried and trusted simple menu with 2 main options of “Where To?” and “View Map”. 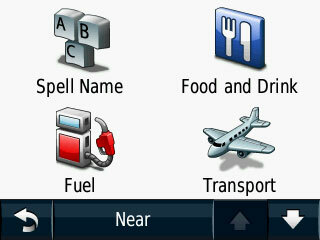 You can also access the settings from the main menu too. When you have a route set you get extra options on the main menu for generating an alternative route or for stopping navigation. I thought I’d give it an easy route to begin with so I used it to take us on the 365 mile journey from Bradford to Newquay. 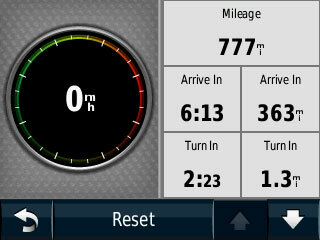 Route calculation for such a long journey was done without much delay and it wasn’t long until we were off. The route was sensible and matched what we would have driven anyway. 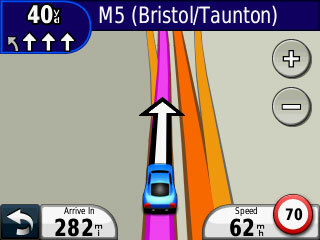 When we stopped at Exeter we decided we would head to a Tesco to stock up on a few essential items (beer, crisps, milk) so I tapped on “Where To?” then selected “Near” at the bottom of the screen. 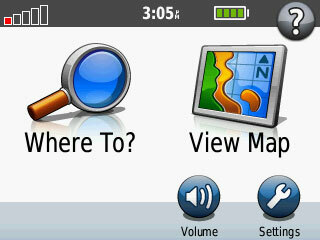 From here I could choose to search near certain places including my destination, my current location and another city. Searching for Points of Interest was nice and easy, I selected Shopping and then Grocery Stores (under which Supermarkets are included). 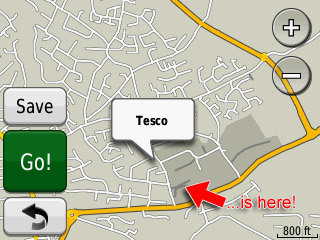 I found a Tesco in Saint Austell that wasn’t too far off our route and tapped “Go”. I was then given the option of making that my destination or adding it as a via point. 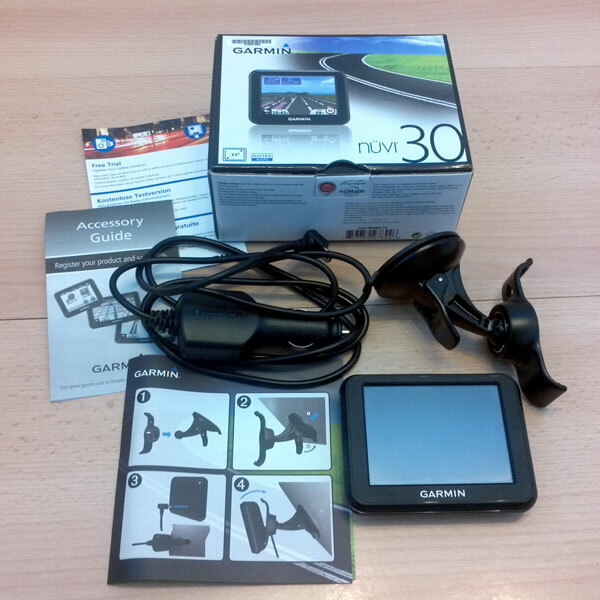 The nuvi 30, as with most of the lower-end Garmin models, only offers a single via point. It was when we arrived that I realised the POI data was actually fairly inaccurate. It took us to a road and proudly declared that we had reached Tesco; in fact it was no where to be seen... So I took a guess and carried on driving and after about 200m I could see the top of a Tesco petrol station so headed towards that and eventually found it. The images below show the difference between the Garmin (or rather NAVTEQ) data and the actual location. This wasn’t an isolated incident though, I’ve always had issues with the accuracy of the bundled points of interest in both NAVTEQ and TomTom (formerly TeleAtlas) mapping. Another incident with POIs was in Hayle where we were meeting friends at The Loggans Moor which is a Brewers Fayre pub. We’ve been here a few times so I knew where it was roughly but searching for ‘Loggans Moor’ under Restaurants gave no results as did ‘Brewers Fayre’. After this I searched ‘Near another city’, selected ‘Hayle’ then ‘Restaraunts’ and scrolled down the list. 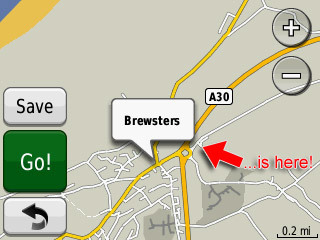 I found an entry under ‘Brewsters’ (which were phased out and rebranded as ‘Brewers Fayre’ way back in 2005) and had a look at the map. Again the accuracy was very poor but, as I knew I could find the real location from here I tapped on ‘Go’. 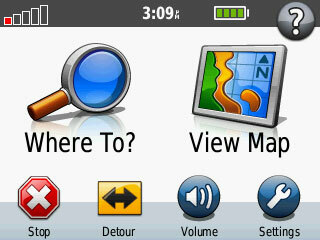 Again, the map below shows the difference between the NAVTEQ location and the real location. Had I not known where I was actually going then I would likely have been rather frustrated with the nuvi 30. 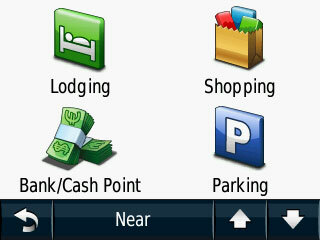 Other destinations available under the ‘Where To’ option include address, points of interest, home, recent destinations, favourites and coordinates. Coordinates can be entered in a variety of formats and the address search also includes full 7-digit UK postcodes. 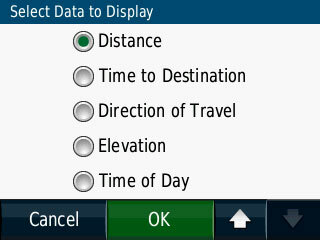 Navigation options (Main menu, settings, navigation) include route preferences of faster time, shorter distance and off-road. Off-road gives you a direct point-to-point route so could be useful for finding a specific set of coordinates without necessarily driving there. 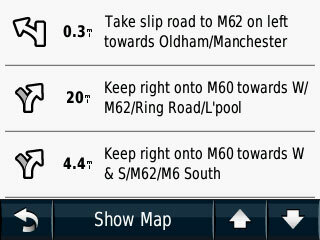 You can also set avoidances for u-turns, motorways (finally, they stopped calling them highways! ), toll roads, ferries, car share lanes and unpaved roads. While using the nuvi 30 it’s worth pointing out that you can drag your finger to scroll up and down the menus as well as tapping the up/down arrows. Although if you are used to a modern smartphone then you will find that it’s not as responsive due to the type of screen used. If you push down fairly hard (or use a stylus or finger nail) then it does work quite well for scrolling. There is no pinch/pull though for zooming in or out of the map. During navigation the route is highlighted clearly in the usual pink/purple that Garmin have used for years. Even though the nuvi 30 features a relatively small 3.5 inch screen the display is laid out well with concise information and enough screen real estate left for the routing. The bottom left has an arrow (taking you back to the main menu) as well as your arrival time, the bottom right shows your current speed, the top bar shows your next turn and current road and there are also + and - buttons for zooming in and out. 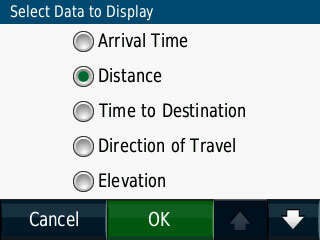 The arrival time can be tapped to change what it displays from arrival time, distance, time to destination, direction of travel, elevation or current time. Tapping the bar at the top takes you to a list of directions for your entire route and then tapping one of these directions gives you a close up map of the junction as well as an estimated time and distance to the junction. 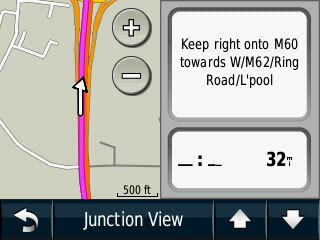 If it’s on a motorway (or some other major roads) you can also tap to see the Junction View. Tapping the bottom right (current speed) takes you to the trip computer where you can see various stats about your journey such as direction, distance to go, top speed, journey time etc. The nuvi 30 has Lane Assist as well as Junction View. This is a useful driver aid as it shows you which lanes you need to be in to stay on your route, the Junction View is a ‘photo-realistic’ view of the junction, along with signs, so you have an idea of what to expect. I do find this a little bit of a gimmick though (it's a static image that does not show your actual position) but the Lane Assist is very useful. The built-in speaker is loud and clear even during motorway driving with music on. The nuvi 30 also has Text-to-Speech so road names are spoken - this was a pleasant surprise for an entry-level device as previously Garmin’s entry-level nuvi 200 series lacked this feature. Navigation instructions are given in good time and the countdown to the next junction is nice and clear at the top left of the screen. Some Garmin units, such as the nuLink! 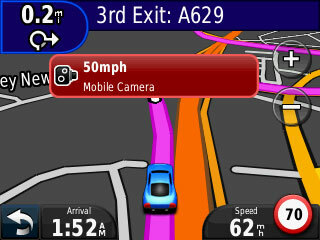 2390 or the nuvi 3790, have been known to offer some slightly odd routes when driving on large A-roads or motorways. Occasionally it will route you off at a junction to go around the roundabout and then come back onto the road you were on previously. I am pleased to say that in the 800 or so miles I’ve done with the nuvi 30 I’ve not had this issue once. 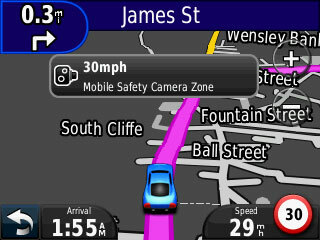 The only time the smaller screen size has a detrimental effect (unless you have problems with your eyesight) is with the speed camera alerts. A large chunk of the screen is covered up to the point where it even makes it difficult (sometimes impossible) to see your route, particularly at a complex junction. Note that this is the same with a 3rd party database such as ours. The overall build quality of the nuvi 30, while pretty much entirely plastic, is very sturdy and well made. The windscreen mount stays attached even in hot weather; older versions used to drop off in the heat when the air behind expanded. All in all the nuvi 30 is actually a very nice PND to use, particularly for the price. If a 3.5 inch screen is a bit small for your liking then you can upgrade to the nuvi 40 which is exactly the same albeit with a 4.3 inch screen and an RRP of £89.99. The nuvi 50 will take it to a 5 inch screen at a reasonable £99.99. It’s packed with useful features and no extra bloat, it’s easy to use and it performs well. I’m happy to give this an outstanding 9/10 when taking the price range into consideration. Especially when probably 90% of the audience aren�t in a position to splash out on such items.